As a British Museum ‘Objects in Focus’ exhibit, financed by the Asahi Shimbun Company, Sowei Mask: Spirit of Sierra Leone displays just the one material object in the room, the mask of the exhibit’s title. When you enter (the rather small) Room 3, you find yourself in subdued semi-darkness, and immediately faced with a central dividing wall, printed to appear as bush, forest, jungle, hut? It is around or through gaps in this wall, which also evoke peering into a dwelling, that you are able to glimpse, in part, the drama of the fully lit, glass-encased ebony mask, in the room’s centre. The relative darkness amplifies the soundscape, provided by Basu’s videos of Sierra Leonean Sande women shot for the exhibition in Sierra Leone in 2011 – drums, a segbura shaker, and song. Detail. Courtesy of the Peabody Museum of Archeology and Ethnology, Harvard University. One surprising feature of the mask on display is its hat. 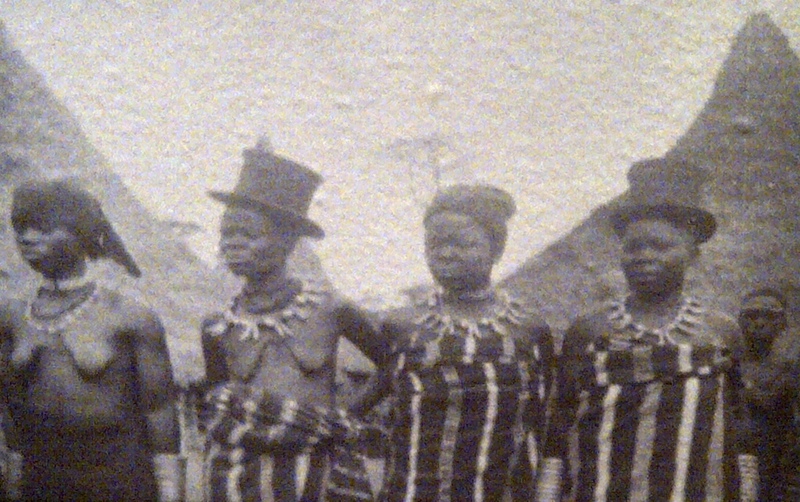 Illustrated by a brilliant archival photo, ‘The favourite wives of Chief Towai, wearing imported Western top hats, 1929’ (AiW’s stress), the exhibition text argues that while European objects – in this case hats – were being appropriated as objects of power by a Sierra Leonean elite, Europeans were busy collecting African objects – in this case masks – to bring back to Europe and display as objects of exotic otherness and barbarism. 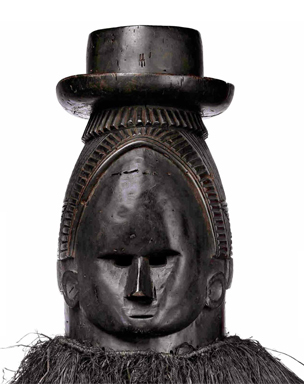 The top hat of this specific mask then illustrates the “multi-directional mobility of people and things”, resulting in a “hybrid object…neither purely African, nor purely European” but existing in a liminal space between, that challenges the “perceived balance of power between the colonised and British colonisers in the late 19th century”. Moreover, while we learn from another panel of the exhibition text that sowei masks are carved to represent ideals of feminine beauty and serenity in the Sande society, a single, almost throwaway sentence tells us that though the mask on display includes common sowei aspects – the elaborate hair style, blackened surface, high ‘noble’ forehead, and small neat features – the absence of others (such as neck rings, downcast eyes, scarification marks, and a lightly pursed mouth) puts its authenticity as a sowei mask in doubt. What is most remarkable about the choice of this particular mask as a British Museum ‘Object in Focus’, then, is not its exemplarity, but its strangeness and ambiguity. 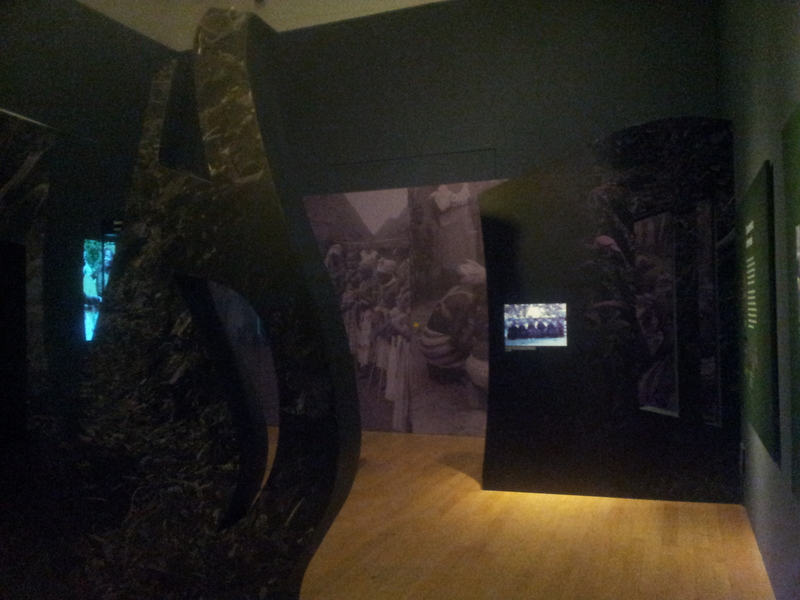 Its ‘apartness’ is emphasised by another exhibition strategy: while the mask sits, implacable and spotlit, the ndoli jowei (‘the dancing Sowei’), performs on the adjacent screen, where Basu’s 2011 video footage is interspliced by black and white (notably static) photos of Sande ceremony from the late nineteenth and mid twentieth century. The juxtaposition of historical reference with contemporary footage does not illuminate the contemporary use of the Sande mask, nor does it reflect the exhibited mask’s specificity: instead it pulls both back. Due to its uniqueness, the mask stands, static and alone. This is not the only sowei mask in the Museum’s collection, and exhibiting it alongside others may have helped to contextualise its own in the many stories of the sowei. The exhibition’s aim to explore “some of the many stories that can be told through a single object collected at the end of the 19th century” is lost; ultimately, the stories fight for prominence as the object and screen dominate. The subtleties of the contextual frame are diminished, leaving a danger of the single story: that this mask was first collected by Thomas Joshua Alldridge (1847-1916) for public display in the Colonial and Indian exhibition in London in 1886; that it became, as a Sowei mask and through its colonial framing, an icon of Sierra Leone, a “recognisable and powerful emblem” of the country. Basu’s astute commentary elsewhere on the inertness, the ‘death’ of objects in ethnographic displays, and the liberating potentials of ‘object diaspora’ for displaced Sierra Leoneans and museums alike, is but gestured to . The Asahi Shimbun Display focus is couched in exoticising terms – an opportunity to view well-known or extraordinary objects from “times and cultures you may not have discovered yet”. 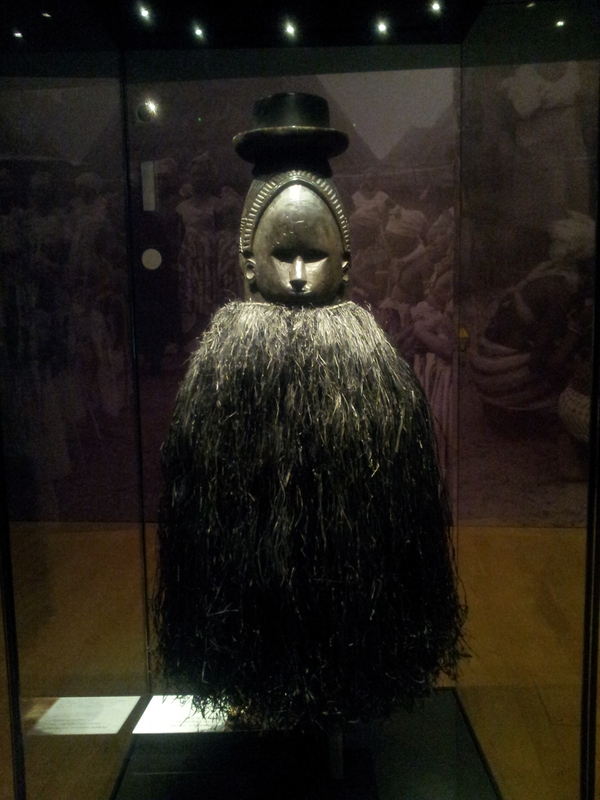 Perhaps it is because of this that the exhibition appears to insist on relocating the symbolic and hybrid value of the Sierra Leonean mask back to the nineteenth century of its original ‘discovery’. The ethnographic display seems to mitigate against the evidence this impressive object itself presents. This also submerges an otherwise interesting emphasis on the object’s current viability as powerful cultural emblem – a cause for camaraderie and social cohesion for post-conflict, displaced Sierra Leoneans. To this end, the exhibition provided a welcome introduction to the website SierraLeoneHeritage.org, by way of a screen and keyboard tucked in the corner. This site, the outcome of University College London’s AHRC funded Reanimating Cultural Heritage project, could have been more prominent. Its clear reflection of two of the main aims of the project would have informed Sowei Mask display choices: a) to key in to aspects of contemporary ethnographic museum practice which strongly appreciates the social potential of objects and material culture, and b) exploiting the possibilities of digital space to ‘reanimate’ cultural objects that have become isolated from their original oral and performative contexts, by placing the ‘ruptured’ objects alongside videos, sounds, texts, images and other media, and giving them ‘new life’. Any ’reanimation’ of the hybrid mask in this light is to be celebrated. But the walls of Sowei mask: the spirit of Sierra Leone speak for the mask in more ways than one: although the display focuses on this beautiful object, in the end it does little to inform the viewer of African, West African or Sierra Leonean art, its ambivalences instead leaving separation and ideas of otherness. 1. 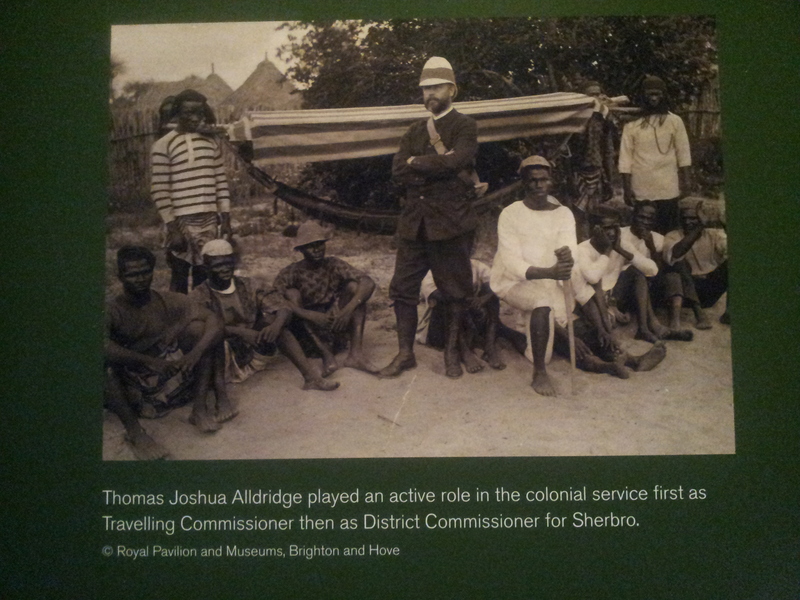 ^ See Basu’s ‘Object Diasporas, Resourcing Communities: Sierra Leonean Collections in the Global Museumscape’, Museum Anthropology 34(1): 28-42, 2011. BM Video: Naming the Sowei Mask with the London based Sande Soceity. BM Blog post by Paul Basu.